All our technical manuals are intended for student use and are self-published. The original manuals were 8.5 x 11 with spiral bindings. We have photocopied these and saved them to PDF to keep the price low. They contain a wealth of information in the form of illustrations and reproduced photographs, descriptions, and essays. They will be emailed with a personal unlocking code. 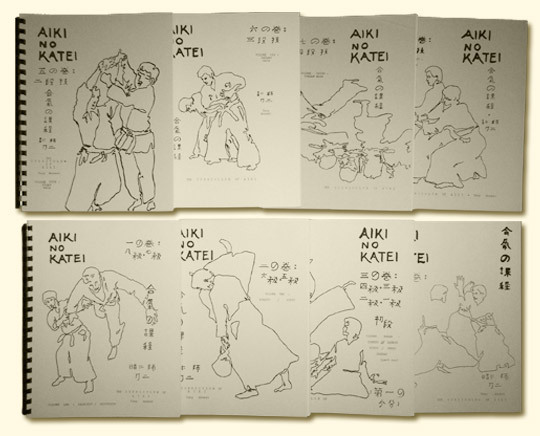 8 volumes, 920 pages of Aiki Instruction at a Reduced Price! PDF download price ONLY $49 for all 8 volumes. Sample of the Hachikyu DVD. Sample of the Shichikyu DVD. Sample of the Rokkyu DVD. Sample of the Gokyu DVD. Sample of Sankyu/Nikyu/Ikkyu Requirements: Elegant Escapes. The second part of sankyu, nikyu and ikkyu groups previous techniques by families, discusses form of entry, suwari and hanmi-hantachi variations, all of which prepares the student for shodan. Includes the essays THE AIKI UKE and AIKI KUMITE-99 pages. Sample of Sankyu/Nikyu/Ikkyu Requirements: Aiki Combinations. Sample of Sankyu/Nikyu/Ikkyu/Shodan Requirements: Aiki Freestyle. Sample of concommittant Nidan DVD. Sample of concommittant Sandan DVD. Sample of concommittant Yondan DVD. 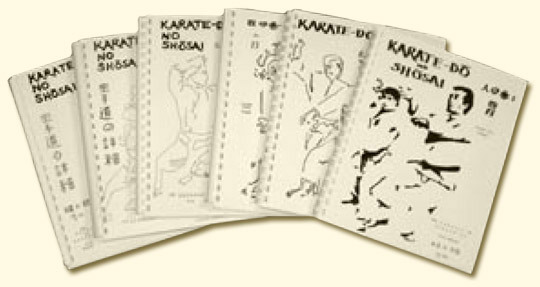 6 volumes, 890 Pages of Karate Detail at a Reduced Price! PDF download price ONLY $35 for all 6 volumes. Shito-ryu and Shotokan method kata are illustrated including: Annanko (Light from the South), Empi (Flying Swallow), Ji-in (Temple Ground), Jion (Temple Sound), Jutte (Ten Hands), Matsukaze (Wind through the Pines), Meikyo (Shining Mirror), Nijushiho (24 Directions), Rohai (Emblem of the Heron), Wankan (Kings Crown); each kata is followed by sample Bunkai, a trademark of Takeshin instruction. Also included are nidan kicking and straight-line sparring requirements and the essay THE FUNDAMENTALS OF JIYU KUMITE-140 pages. Shotokan, Goju and Uechi method kata are illustrated including: Bassai-sho (Breaking through a Fortress, minor), Chinte (Unusual Hand), Gankaku (Crane on a Rock), Hangetsu (Half-moon), Kanku-sho (Viewing the Sky, minor), Goju Sanchin (3 Conflicts), Uechi Sanchin (3 Conflicts), Sochin (Tranquil Force), and Taihanchin (Our Greatest Example), a Kamishin kata. 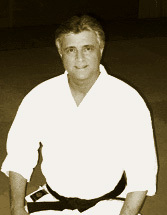 Each kata is followed by sample bunkai. Also included are sandan kicking and in-close sparring requirements-170 pages. Goju and Uechi method kata are emphasized: Gekisai Ichi (To Attack and Smash, one), Gekisai Ni (To Attack and Smash, two), Gojushiho-dai (54 Movements, major), Gojushiho-sho (54 Movements, minor), Saifa (The Final Breaking Point), Seienchin (The Lull in the Storm), Sanseru (Thirty-six), Goju Seisan (Thirteen), Uechi Seisan (Thirteen), Unsu (Cloud Hand); Sample Bunkai for each kata; yondan kicking and sparring requirements (fluid power and sen-no-sen)-174 pages.